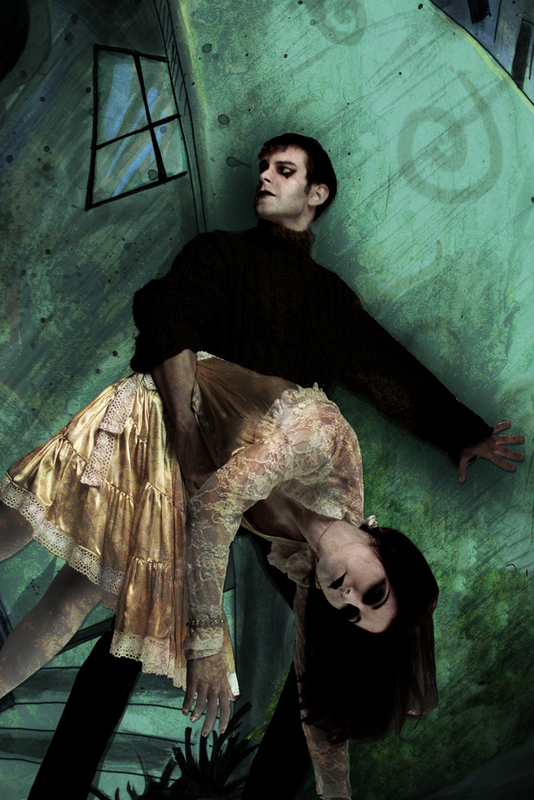 Yesterday afternoon I went with some friends to see something that promised to prove special--a dance version of the classic Expressionist film The Cabinet of Dr. Caligari. For those who don't know, almost any film student would tell how Caligari changed cinema forever. It became a film that brought you into a new world, then persuaded you on a visceral level this world was your own--a heightened reality making things somehow more true via the distortions. Then it emotionally makes you fundamentally uncertain of anything. We become totally absorbed in the Hero and all that he believes, loves and wants. Then we learn he's wrong about everything. Yet--and here likes the genius of it--we remain emotionally still on the hero's side! Our intellectual and emotional understanding of the world become totally in conflict, and we feel the conflict! Recognize it! So, like the film, we spend the bulk of the performance in flashback. On one level, what follows makes for an exciting thriller and spooky horror story. Indeed, many credit Caligari as the first horror film. Francis and Alan (Olivia Bollfrass), best-est of friends, decide to attend the carnival that just arrived in town. Along the way they see Jane, the Mayor's daughter, whom they both love. Both agree the choice must be hers, but either way they remain friends! 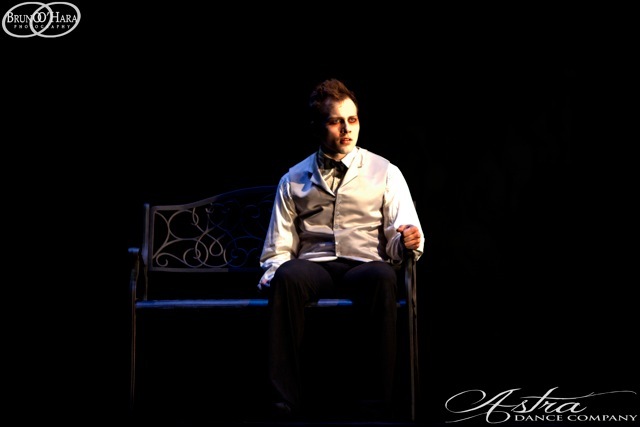 But then, they go to the side show, to see the somnambulist Cesare (Brandon Binkly) whom his keeper Dr. Caligari (Roger Fojas) insists can predict the future! Alan asks "How long do I have to live?" The reply, "You have until dawn!" horrifies all who hear it, not least because a grisly murder occurred the night before. Next day, Francis visits Alan and discovers his friend murdered. He's right. 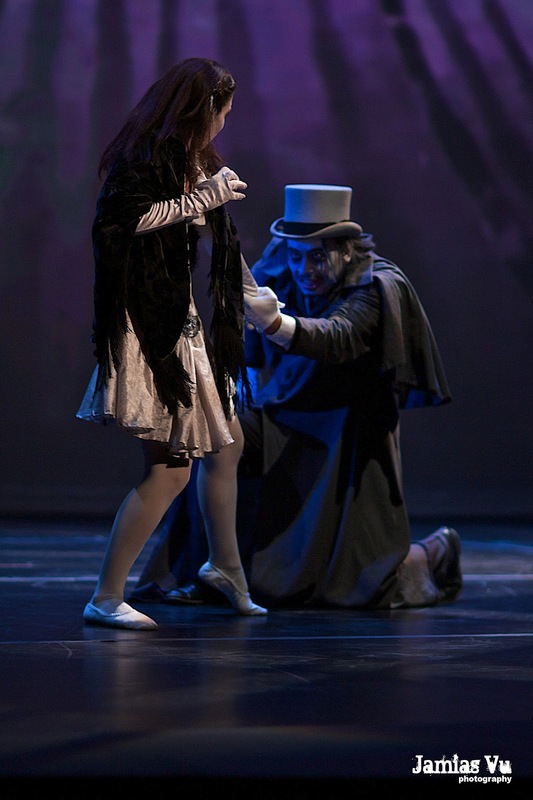 Caligari sends Cesare out to commit murders each night. The next evening, his target is none other than Jane! But this time the somnambulist hesitates, entranced by her beauty. Instead, he kidnaps her--yet another horror as she is still reeling from the news of her friend Alan's brutal death. 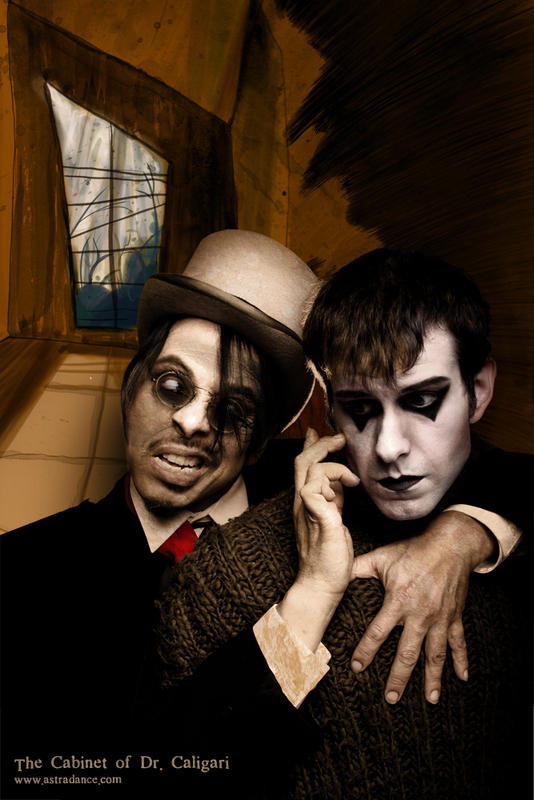 A brief encounter with Caligari and Cesare while looking for Francis made things worse for her fragile nerves. Now she becomes hysterical. Rescued as Cesare flees from a mob, her suffering inspires Francis to follow the doctor to the local Asylum where he flees. But there Francis learns the Asylum Director pretends to be Caligari, and with the staff as well as police officers learns of the man's obsession with an 18th century mountebank named Caligari, a man who "left a scar upon the world" by using a somnambulist to commit murders, holding whole towns in a grip of terror. Upon learning Cesare was killed, the Director loses his self control and has to be restrained. "From that day until this," says Francis, "the madman has never left his cell." But Jane, poor Jane, has never really recovered from the shock. All this sounds like a fun tale for Halloween, but in fact it becomes much much more. The "look" of both film and dance play make it dreamlike yet weirdly appropriate. Houses look like a dark vision from Dr. Seus, even the color palette not quite real, yet strangely familiar. 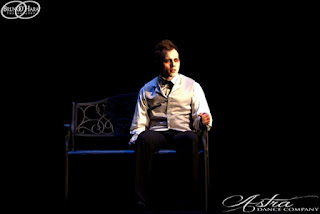 The cast wears white face make-up and white gloves, all save Cesare whose gloves stand out as black. It all ties in with the plot, which actually builds upon questions of reality. The carnival with its otherworldly delights. A romantic triangle we expect to result in conflict, but never does. A sleeping man who talks, and gives self-fulfilling prophecies. Confusion over who is who, what we can consider real, when do we dream and when not? It is a world where the idea that the director of a madhouse would of course turn out to be insane. Both familiar yet disturbing. So have we any right to be surprised or upset by the final twist? Francis and his companion we see return back to the asylum where they live. Patients. Lunatics. Francis sees "Alan," amazing his friend is yet alive! He sees Cesare and others. Jane he piteously approaches, clearly in love or seeming so with a delusional girl lost in her own reality, with no notion whom he might be. Finally, the director of this, the REAL asylum, walks in. Francis shrieks CALIGARI! And attacks him! Attendants force a straightjacket onto him. But the directors notes "At last I understand. He believes me to be Caligari! But now I know how to cure him!" But for all we've now seen, the director still oozes sinister intent. Or does he? As the dance ends, we see him pick up a book about the mountebank Caligari, the figure in whom Francis insisted this man had become obsessed. Was Francis the madman right? Is the director evil and insane? Or is he studying Caligari in hopes of curing the lad. Or both? Or neither? We don't know. We can never know. Hence this story's power! 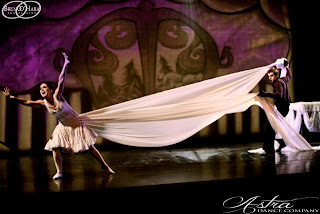 Captured with great skill by a dance company that never stops giving us this intense dreamlike reality. The police with their rigid, almost military unity. Poor Jane as we see her sanity shred under one terror after another. Asylum doctor who with Francis discover the director's notes and react in ever-growing horror at the contents! Or the physical (but silent) laughter from Caligari at the end of Act One as we see someone else arrested for the first two murders. At that moment, we know him guilty, without any evidence at all. And yet, even at story's end, is he really guilty of anything? If so, what? The original music in the show was composed, arranged and mastered by Regan Remy. I for one am seriously tempted to look for a CD of this score when it becomes available. While eerily lovely and compelling, it also captures the strange essence of the story. Kudos! 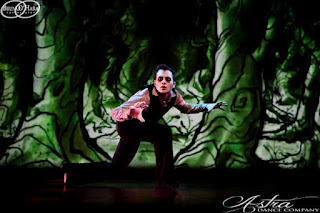 The Cabinet of Dr. Caligari plays until October 6, 2012 at the El Portal Theatre in North Hollywood. I strongly recommend it!